North Northumberland Inspector Liz Hall. Police have played down Facebook messages which warned residents to be wary of a gang trying to steal dogs. Last week, various posts appeared on the social-media site, stating that a group of men were posing as fish sellers as a cover to pinch people’s pets. Facebook users claimed that the gang was travelling around in a blue van and had been spotted in the likes of Shilbottle and Pegswood. Another post, which featured a picture of a blue van, said: ‘Anyone sees this van, watch your dogs. He has been seen in Pegswood (parked outside my house) looking for dogs to take. ‘Four white men pretending to sell fish. I’ve been told he was looking through my windows looking to see if I have dogs. 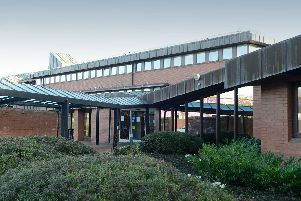 The Gazette contacted the police to find out more, but Neighbourhood Inspector Liz Hall said the comments had no basis. She said: “The males involved have been investigated for selling fish at inflated prices to elderly residents in a separate area of the Force, but no offences were identified and no prosecutions pursued. “There is no basis for the Facebook comments from a policing perspective and we have no information that would confirm this.